Lindblad Expeditions-National Geographic has excitedly launched a Fly Free offer to Alaska, making this stunning wilderness area more accessible than ever to Australian explorers. Travellers receive free return economy airfares from Australia to Seattle, Alaska when booking Lindblad’s Treasures of the Inside Passage 14-day itinerary departing either the 6th or 12th of May 2019. This itinerary will leave guests spellbound as they travel between Seattle and Sitka along the Inside Passage, enjoying the wildlife-rich channels of Canada’s British Columbia, the breathtaking fjords and towering glaciers of Alaska and the abundant natural beauty of all locations visited; which include the San Juan Islands, Gulf Islands, Misty Fjords, Frederick Sound, the Inian Islands, and by special permit, a full day exploring Glacier Bay National Park. In addition, guests will discover the cultural facets of this coast during captivating performances and interactions with the Kwakwaka’wakw people of Alert Bay. 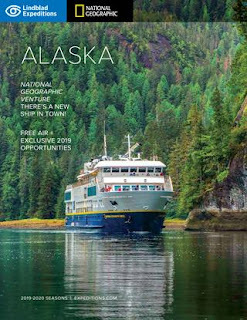 Guests will explore the vast and pristine natural wilderness that is Alaska onboard Lindblad’s first new builds in the line’s history, the 50 cabin National Geographic Venture or the National Geographic Quest. Every expedition sails with a veteran expedition leader, a team of expert naturalists, an undersea specialist, wellness specialist, and a Lindblad-National Geographic certified photo instructor. Together, they provide guests with a greater understanding and appreciation for these exceptional places. Choosing to voyage Alaska with Lindblad Expeditions provides guests with an in-depth connection which is unrivalled in the industry thanks to their 30 plus years of experience and heritage in the region. For more information on Lindblad Expeditions visit www.expeditions.com or Facebook, Twitter, Instagram, YouTube, Pinterest and LinkedIn.